Return period calculations placed in the hands of those who don’t know what they are or how they work can be dangerous things. There is a difference between describing an event as “one only seen every quarter of a century” and calling it a one in 25 year storm. The second is a formal statistical calculation while the first is…just plain wrong. 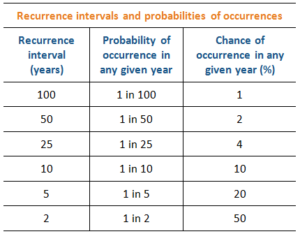 Essentially, a given area can experience a 1 in 100 year event more than once in a year or in consecutive years, for example. It is all just statistical probability, like the chances of rolling snake eyes 10 times in a row (a rare result, but statistically possible). It was Allen who first called the Fort McMurray wildfire ‘The Beast’, a moniker that I have refused to use, and grudgingly repeat here only to make a point. As one media outlet described it, calling the fire The Beast “…appears to have personified the fire as an almost human enemy.” Calling it The Beast, in my mind, reinforces the idea that the fire was really exceptional when, statistically, it wasn’t. Now don’t get me wrong, a loss of the calibre of Fort McMurray has never been experienced in this country before. But the fire itself wasn’t all that exceptional. By some estimates, the return period was about 1 in 45, roughly the same as the 2013 southern Alberta flood, which has also been positioned by politicians and others as extremely exceptional. When one looks at historical large fires in Canada, there have been many large, intense crown fires around the northeastern portion of Alberta going back many years. In some cases, burn scars are still plainly visible in satellite imagery. Large, intense crown fires in the boreal aren’t that rare, it is just rare for a community to get in the way. Believe it or not, the same can be said of the current fire situation in B.C. – it really isn’t all that exceptional. A bad year, to be sure, but such years are not uncommon in that neck of the woods. As I have said before, the boreal is designed to burn, and burn it does. Generally, I find that return periods are commonly (mis)used by two main groups: media and politicians, and both seem to have a vested interest in using return period data in their own way and to their own end. Media seem to lean toward using return periods for dramatic effect (I nearly spit out my coffee when I read one journalist call a 1 in 100 flood plain a ‘centenary flood zone’). Politicians (particularly local) often use return periods to attempt to show that a particular event was so big and so rare, that nothing could have been done to prepare for it (i.e. using return periods as a baby uses a diaper). To that end, a friend told me that he heard someone in the press calling the recent flooding in Gatineau a 1 in 10,000 year event. It was no such thing. It is challenging enough to communicate hazard risk to people without mis-using such things as return period calculations. One thing is certain, use of the word ‘year’ (eg. a 1 in 100 year event) in a return period is confusing, and some have suggested that –at the very least – the word be dropped when reporting return periods (eg. a 1 in 100 event). Using the AEP means that we would go from a ‘one in 25 year event’ to describing it as having a 4% chance of occurring in any given year. This sounds like a good way to go and is a pretty easy fix.